On the sleepy spring morning of Thursday, May 29, 1986, a new arrival was eagerly welcomed in the stable by the curious nicker of horses. He was a noble bearing colt, dressed in a rich burgundy satin resembling the colour of a fine red wine. His sharp features of a delicately defined head were anointed with a bright star. Cautiously he peeked his nose out from beneath the camouflage of his mother's tail and craned his somewhat long neck in search of exciting scents in this mysterious world. He was undeniably handsome from the moment the sack was shed to reveal his true identity. As the colt found unsteady support from his wavering long limbs, he clumsily bumped his way along his dam's sides and quarters, until he was rewarded with the warm nourishment from his mother's fulsome teats. Everything had appeared normal up to that point. The foaling went well, the colt seemed alert and inquisitive. He was up and moving with new found strength and improved equilibrium in every step. The mare was grateful for the relief from her aching and swollen udder, as the long suckling noises brought contentment and joy to a famished new member of the equine species. It was not until the colt had had his fill of that all important protection of colostrum, or first milk, when he turned to greet his dotting human companion and something unusual was revealed. A soft cough was heard and a slow steady trickle of white fluid drained from his nostrils. As the colt returned to nurse at his mother's side, again the milk trickled from the nostrils and the spontaneous cough persisted. Alarm bells rang - something was terribly wrong! The usual visit by the veterinarian was hastened this time when the observations of the new born colt were relayed. The arrival and diagnosis of the attending veterinarian set in motion an emergency plan of action. Within twenty-four hours, Flash and his mom were loaded into the now converted box stall in the spacious six horse trailer and were on route for a two hour journey to Large Animal Admissions at the University of Guelph (Equine Centre). On May 30, Flash was examined by a battalion of veterinarians and surgeons. The endoscopic examination and diagnosis was that Flash had a soft cleft palate or incomplete closure affecting his windpipe and trachea. There were three options of choice available: do nothing and let nature take its course; euthanize the colt, or surgery. Without surgery, he may not have survived and might quite possibly succumb to respiratory failure via pneumonia or infection. The time for surgery with the best prognosis, was now. The decision we came to was to give this darling little fellow, a chance. So less than a week from his birth, Flash underwent his life-saving operation to repair his palate. As with any surgery, there was no guarantee that the operation would be totally successful. Indicators of its success would be observed in his latter progression and rate of growth . There was no way of foretelling the fate of this little Morgan colt. Flash came through his surgery well and after several days was finally allowed to come home. He would later return to Guelph for re-examination and evaluation. During the interim, special intensive care at home would have to be provided during his nearly two month convalescence. A daily journal was kept of all observations, temperature and treatment administered. These findings and readings were recorded every one to two hours with only a reprieve from note taking during the late night hours. Flash was closely monitored, the incision site medicated and protected against the constant onslaught of summer flies and dust; the antibiotics administered as instructed. On July 21, Flash was re-admitted to Guelph for follow up evaluation. The report was positive. The repair to his palate appeared to have been ninety per cent successful. Now it was just a matter of time that would determine just how successful the surgery had been, remembering that the growth of the colt was a strong determining factor. 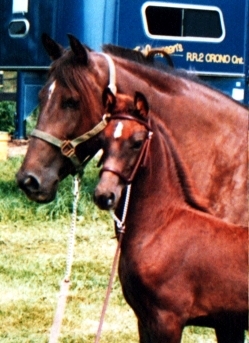 In the spring of 1988, Flash caught the eye of a prospective buyer who visited the farm. Shortly thereafter, Flash was sold with a full discloser of his medical history. The now tall two year old continued to mature rapidly and was becoming a very pretty boy indeed. Flash bid farewell to the only home and family he knew, as he travelled to a new stable and a new life; everyone filled with excitement and promise. However, the final chapter to this story had not been written. Just two years after his sale, and with a tone of distress in his new owner's voice, a disturbing phone call was received. She (the owner) had suffered an unfortunate accident being thrown to the ground during a wind storm, fracturing a vertebra. In hind sight, it was an accident that shouldn't have happened. Flash, a novice horse just newly put under saddle, had become the recipient of retaliation for his part in the incident. His attacker, someone ignorant in the knowledge of horses and handling, mistakenly presumed that the horse was the doer of bad deeds and was to blame for the injuries. So in the heat of the moment, Flash had been savagely beaten. The mere sight of a saddle and bridle now evoked a trembling frenzy within the horse that was not easily calmed. His owner was deeply saddened by the unfortunate turn of events and just wanted to have her old Flash back. It would later take the better part of two months of intense conditioning and confidence building to bring Flash around to accept his tack, let alone a rider again. And so, Flash returned to his birthplace once more. Although the somewhat over used popular term of the day, namely "horse whisperer," congers up connotations of mystical ways, I am reluctant to attached this label to myself. Whatever title you may want to bestow for my role and method of training is unimportant. There really is nothing magical about it, suffice to say that it involves a capacity for compassion, enormous patience and simple understanding of the horse's mind and circumstance. The journey of Flash's ascension from unbridled fear and despair would begin. Those once healing hands that soothed his incision, the soft voice that gave him comfort during his young days of recuperation, would return to instill trust once again much as a kindred spirit. It was a daunting task to restore a frightened fragile mind to its former self, or closeness thereof. But little by little, Flash began to respond until his transformation was complete. All too soon, it was time to say goodbye yet again. I can still remember the day they came for him. He was loaded into a pony trailer that was dwarfed by his now 15.2+ hand, 1,200 lbs. frame. I had lent them a helmet to protect his poll from trauma as he willingly walked on the trailer, stooped, and travelled home in that position. Only unshakable confidence in his handler would allow him to enter such small confines and tolerate the ride in such cramped quarters. Six years later, another desperate call would come. This time, Flash's owner's personal situation had become precarious and she feared that Flash might possibly become a target of violence once again. An urgent plea was made for us to try and find someone to lease Flash until her life could return to some normality and she could be reunited with her best friend. 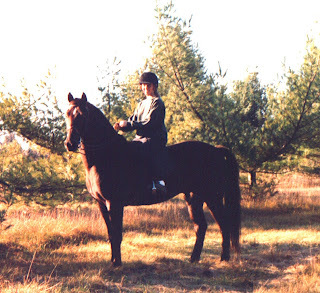 After several phone calls and attempts to secure a lease, Tanya, our junior rider at the time, entered the picture. It was a cold windy day in late fall when we first saw Flash grazing alone in a large open field with only sheep as his companions. It had been months since he had last been ridden, but the meeting went well and at the end of the visit, a signed lease was tucked safely in hand. The union between Flash and Tanya would become one of utter devotion. So once again, this time under stressful circumstances and with some trepidation on our part, Flash walked up the ramp and came home to Trillium. Flash and Tanya would blossom not only physically, but in spirit, each giving one another a sense of worth; each learning that you can't always have your own way. In summer, they would travel the show circuit and tranquillity of the woodland trails. They were good for each other, inseparable - every day growing and learning about themselves. For a teenager going through the typical mayhem of youth, Flash had become an anchor, something solid and secure to hold on to. Something you could believe in and would keep you focused. As the lease formally came to an end, and Flash was to return home, more than a few tears moistened the cheeks of those involved with this horse. When it was learned that he had found a new owner and home, Tanya felt it difficult to accept that her beloved Flash would no longer be a part of her life. It took great courage for her to watch Flash and his new owner parade the show ring. (I'm certain that Tanya rode every stride of the class from the rail.) But with maturity, Tanya soon accepted that Flash was loved too and being cared for as he should. Tanya can take pride in knowing that she in some small way contributed to his success. So if by chance you wonder why all the hoopla and hollering that follows this majestic horse down the rail, the tri-colour hanging from his headstall dancing in the breeze of a victory pass, just know that there is more behind the applause and cheers for a simple ribbon won. It's a celebration of struggle and accomplished that Flash has overcome and achieved. He has touched many lives as he trotted a true path over a trail of past illness, abuse, misfortune and lost love. The title of champion befits him, not only for his great ability as a Morgan horse, but also for his dauntless courage. If we had it to do over again that Friday afternoon in May, as we reflected upon our options over a cup of coffee, the decision would probably be the same - we would do it "for the love of Flash".